I’ve been getting a weird vibe from Oregon Men’s Basketball and am wondering if any of you feel it as well. 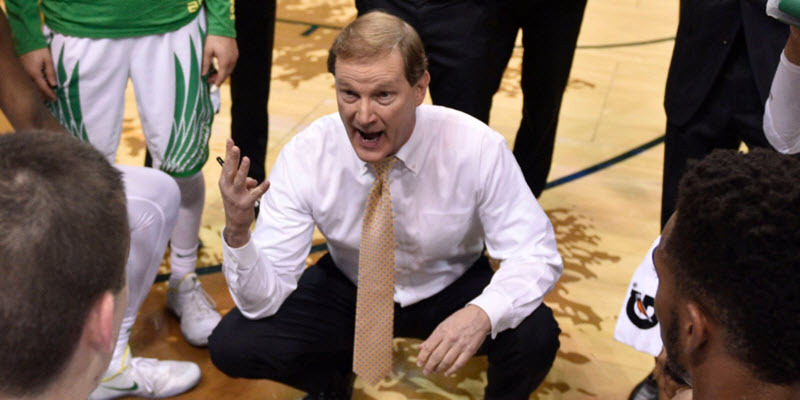 This has nothing to do with the tremendous job Dana Altman has done during his time at Oregon, but is more of an acknowledgment of how the changes in college basketball have finally caught up to Oregon. It feels like the program is transitioning into another phase, and while there is excitement—there is also sadness at the passing of an era for Ducks basketball. You know where I’m going with this … do you feel it, too? Every year Oregon outperformed the preseason conference predictions for them using the scrappy, tough play of players Dana coached to overachieve, and we all remember our favorites over the years. They would grow over three years and we fans would get to know them and feel for them. “One-and-done” was unknown, as we developed players at Oregon. Remember the patience Altman practiced to just get Jordan Bell on campus? And how the young man could barely shoot the ball at first? 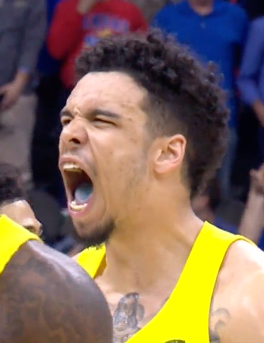 The growth that he and Dillon Brooks underwent was astonishing, both in talent and in heart. Nobody could will a team to victory like Brooks. This process takes time (it took them three years! ), and yet, this kind of development is not what the new NBA-type players coming to Oregon are about. Hey—I love the five star recruits, too, and am curious to see the superlative plays that await our entertainment next year. Yet, the fact is, going deep into the tournament takes experience. All the top coaches will tell you that; the NCAA Champions will confirm it. But that doesn’t fit with the interests of most of the top players in the U.S.; it’s all about getting into the league. Brown in the First Round? What? You really need players on the team for three years to make a serious Final Four run, as we saw in 2017, and that is not the type of team Oregon is building. Yet, if Dana built my three-year team of low four-star players, and they developed gradually as Bell and Brooks did … there would be a lot of losing in year one, a notch above average in year two and wonderful success in year three from the development and growth of these matured players. Are we fans going to be patient through that three year cycle? Let me answer that for you: hell-no! 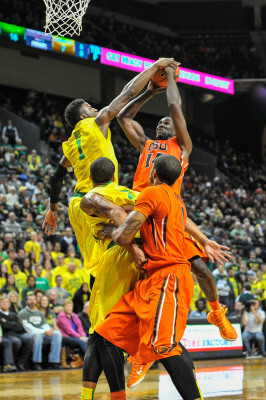 Jordan Bell rejects an Oregon State player, adding to his record breaking block total. Dana needs to keep his job, too, so he has to do what he has to do because we fans are short-sighted (me, too—no indictment). The result is that tremendous talent leaves after one year, and the team hopes to retain enough players (and add a few more) to make a run the next year. This inevitably becomes a better than mediocre, but stalled level of middling success. Not .500 ball, but 27-30 wins. Respectable, Sweet Sixteen seasons, but not the National Championship we desire. You can’t have it all, and Dana is in a rough spot. The best scenario is that five-star talents stay for at least two years, even three. Then Oregon could become a perennial Final Four resident. The world has changed, and it isn’t going back. AAU Basketball, agent/mentors, FBI investigations and player payoffs … geez, it is ugly. Dana is trying to compete in this new world (honestly) and trying to get our piece of it. We have to hope for the best on a year-to-year basis. Sadly, extended player development and the three-year continuity in building a championship team are the dreams of a bygone era.